Happy 2013 from all of us at Coursera! 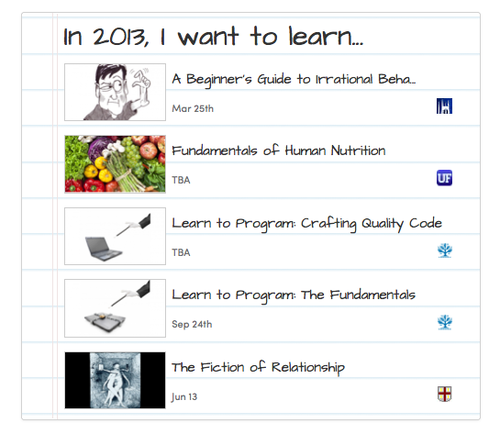 To help you set and proudly share your 2013 learning goals, we’ve created this nifty list maker. Browse our 2013 courses, select the ones that you want to take, and then share your list with friends and family. Perhaps you want to become more knowledgeable with your personal finances and investments, or maybe you want to improve your math skills, become a better musician, or become a data scientist, or maybe you want to learn more about food and nutrition. Here’s to 2013, may it be filled with love and learning! To create your own list, start here.